Take the digits 5, 4, 3, 2 and 1, in that order. Using those digits and the four arithmetic signs — plus, minus, times and divided by — you can get 1 with the sequence 5 – 4 + 3 – 2 – 1. You can get 2 with the sequence (5 – 4 + 3 – 2) x 1. The question is … how many numbers from 1 to 40 can you get using the digits 5, 4, 3, 2, and 1 in that order along with the four arithmetic signs? You can group digits with parentheses, as in the example. There are no tricks to this, though. It’s a straightforward puzzle. How many numbers from 1 to 40 can you get — and, specifically, what number or numbers can you not get? operations to get your answer. How many combinations can you find? Ariel, Ollie and Eden are going trick-or-treating for Halloween, but first their parents are taking them to a costume store to pick out costumes. The store has 9 different costume options available – witch, pirate, cat, superhero, princess, vampire, fire fighter, zombie, clown. In how many different ways can Ariel, Ollie and Eden each select one of these costumes, with no two of them wearing the same costume? 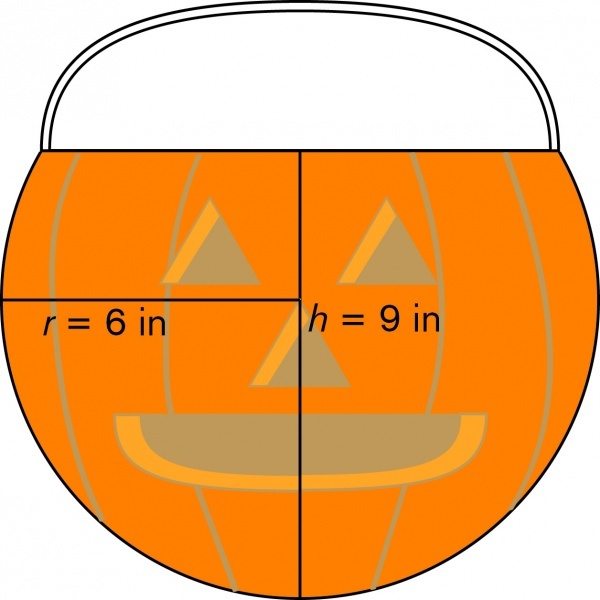 To carry their candy, Ariel, Ollie and Eden each have a bucket that looks like a pumpkin. It is completely spherical in shape with a straight slice across the top of the bucket that creates a circular opening for dropping in candy. If the radius of the bucket is 6 inches and the height, measured from the base of the bucket to the open top, is 9 inches, what is the area of the circular opening of the bucket, in square inches? Express your answer in terms of π. Last year, after Ariel, Ollie and Eden went trick-or-treating, they combined all their candy together and sorted it. They found that 1/3 was chocolate candy, 1/4 was hard candy, 1/5 was candy corn and the rest were fruit chews. If they had a 180 pieces of candy total, how many pieces were fruit chews? The third graders have been hard at work. After learning about Chinese Numerals, Egyptian Numbers, Roman Numerals, and a variety of base systems, the third graders are ready to create their very own number system. They are working in pairs to develop a number system in a base other than 10. They are designing their digits, converting between systems, and computing addition and subtraction problems! They cannot wait to share their ideas with the class! The second graders are working on creating tessellations. After learning about planes and adjacent vertices, they drew and cut-out their own stencils to make tessellations. They have learned to determine which polygons will make tessellation and which will lead to gaps and overlaps! Next, they will be investigating three-dimensional shapes, surface area, and volume! The second grade students have been learning about transformations. They can transform images through rotations, reflections, and translations. Eventually, they will apply their knowledge to transformations on a coordinate plane. Because of this, we worked together to identify the x-axis and y-axis so that they could plot ordered pairs. In anticipation for Thanksgiving, they are creating a mystery image by plotting coordinates. We will have to wait until after break to uncover the image! The first grade students have added to their geometry knowledge by studying angles. They have learned that angles are formed when two rays share a common vertex. The first graders can identify and describe right, acute, obtuse, and straight angles. Today in class, they used their knowledge to make geometry riddles similar to the one above! The third grade Navigate students have been busy exploring ancient number systems. They have learned to write in Egyptian and Roman Numerals. Both of these systems had their positives and negatives. The students found that Egyptians had a number system in base ten so it was easier to understand, but writing out numbers proved to be time consuming. During our discussions on Roman Numerals, the students realized that they needed to be very quick at mental math in order to figure out the values of the numbers. We discussed expanded form as well as the similarities and differences of our Hindu Arabic number system! The second grade Math Navigate classes started their geometry unit. They have been exploring lines of symmetry and symmetrical shapes. Using mirrors, they have discovered that some shapes are not symmetrical while others have an infinite amount of lines of symmetry. They will be putting their knowledge of symmetry to good use in this week’s math task! Next week they will start looking at reflections, rotations, and translations! The first grade Math Navigate students have started their Geometry Unit. They have been working on identifying and naming polygons while using new math vocabulary. They played a few games of LINGO in class to test their knowledge while having fun with their classmates. This week they will be creating compound shapes, identifying variables, and looking at concave/convex polygons!